Zachary Sanders, the president of the Jazz Orchestra, plays the saxophone in a Phillips Hall rehersal room. He started the group after jazz jam sessions were cut due to budget cuts in the music department last year. Updated: Sept. 23, 2016 at 3:39 p.m. When budget cuts restructured the jazz studies minor and jam sessions from the music department in 2015, students had to find other ways to experience jazz. Classes specific to the jazz studies minor were folded into the umbrella music studies minor, but the jam sessions — in which students and faculty came together to play extemporaneous jazz music — were no longer funded by the department, music faculty said. 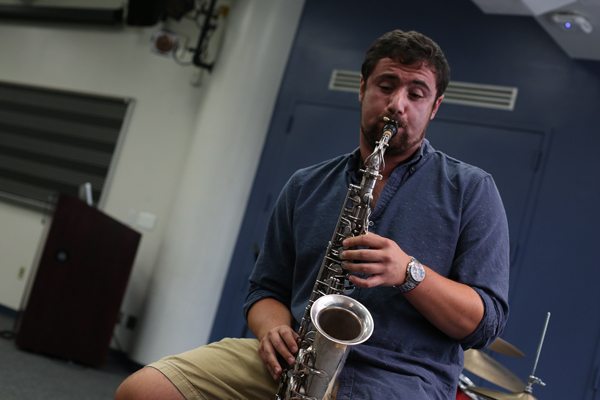 Students and faculty said jam sessions are necessary for young jazz musicians. “The cuts really ripped out the backbone of the entire jazz program here at GW,” Zach Sanders, the co-founder and co-president of the GW Jazz Orchestra, said. But students have found ways to keep jamming: They started their own student organization dedicated to jazz and turned to jazz clubs around the District to supplement their educations. Unfortunately, the demise of jazz at GW is reflective of the slow decline of jazz clubs in the District, music professors said. Sanders and Peter Reiss, who are both juniors, founded a student-run jazz orchestra in 2015. The Jazz Orchestra wasn’t started with jam sessions in mind, but budget cuts forced them to start holding their own jam sessions on top of their larger ensemble practices. Sanders and Reiss were inspired by the departmental big band to start their own ensemble. Eventually, an offshoot of the ensemble evolved to fill the hole left by the loss of jam sessions. College is often the first time amateur musicians have exposure to jazz jam sessions, Sanders said. “Not everyone comes into college with a high school background in jam sessions,” Sanders said. Although the Jazz Orchestra receives an annual allocation from the Student Association, it doesn’t receive enough to afford professional instruction from faculty. The jam sessions are just one component of the orchestra: Aside from the impromptu sittings, there’s an ensemble that performs on International Jazz Day and at their annual spring and winter concerts. Kip Lornell, an adjunct music professor who studies ethnomusicology, said students have to create their own opportunities for learning jazz. But a lack of guidance from experienced jazz performers at their jam sessions and practices could be a detriment to their jazz educations, he said. “With less faculty, it’s likely that the level of musicians would be uneven,” Lornell said. GW students have access to jazz venues and musicians around the city, though. Tyler Cassidy, a master’s student in the Graduate School of Education and Human Development, said he has learned the most by visiting jazz clubs around D.C., especially on U Street. Cassidy is an avid jazz cat at night, ripping away at his tenor sax at clubs or events like Twins Jazz or Jazz Night in Southwest D.C. For him, experience has been the best teacher, he said. The jazz scene in the District is friendly to newcomers, he added: Younger musicians with passion and promise were invited to play with well-known professionals on stage during the closing show at the Bohemian Caverns. Twins Jazz was also well-known for providing a stage for high school and college musicians. But with jazz slowly fading around the District, students soon may not have many opportunities to jam at all. Twins Jazz on Colorado Ave., One Step Down and Bohemian Caverns were all jazz clubs that have closed over the past decade because they weren’t bringing in enough revenue. No new clubs have opened in recent history. Lornell said gentrification in the city, not lack of interest from the community, has forced jazz clubs to close. “As D.C. gets less and less African-American, there are less avenues for jazz,” Lornell said. Jim “King James” Levy, a lecturer in GW’s music department, disagreed, saying that jazz has simply changed its face since its heyday and that there are different types of venues where musicians can play. More jazz cats are finding their homes at special events dedicated to jazz, or by mixing jazz with other genres, like swing, he said. Jazz Night at Westminster Church and Bossa Bistro and Lounge are such non-jazz venues where jazz musicians often jam. “It’s an interesting way that jazz is surviving,” Levy said. The Hatchet incorrectly reported that the Jazz Orchestra did not receive any funding from GW. They do receive funding from the Student Association. This article appeared in the September 22, 2016 issue of the Hatchet.